House Speaker Paul Ryan is rejecting President Donald Trump's suggestion that the Justice Department shouldn't prosecute two GOP congressmen because it will hurt the party's election prospects in November. Ryan tells reporters Wednesday, "Justice is blind. Justice should be blind." The Wisconsin Republican says political party should have no impact on how the department works. Ryan became the latest Republicans to criticize Trump since the president tweeted Monday that the Justice Department should take his political views into account when pursuing investigations. Trump criticized Attorney General Jeff Sessions for prosecuting the two GOP lawmakers just before midterm elections, saying, "Two easy wins now in doubt because there is not enough time. Good job Jeff." Ryan adds that "the process is working its way as it should." 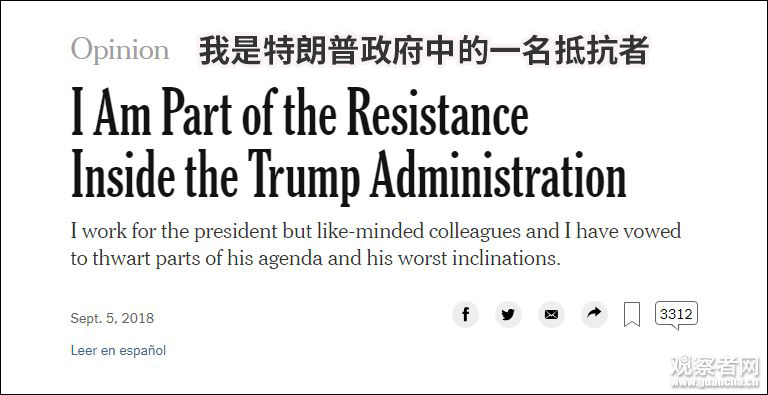 An anonymous opinion article published in The New York Times earlier in the day, which the newspaper said was written by a senior administration official, asserted that a handful of appointees, serving at the highest levels of the Trump administration, consider the president to be “amoral,” and on the precipice of dangerous decisions that could put the country at risk. 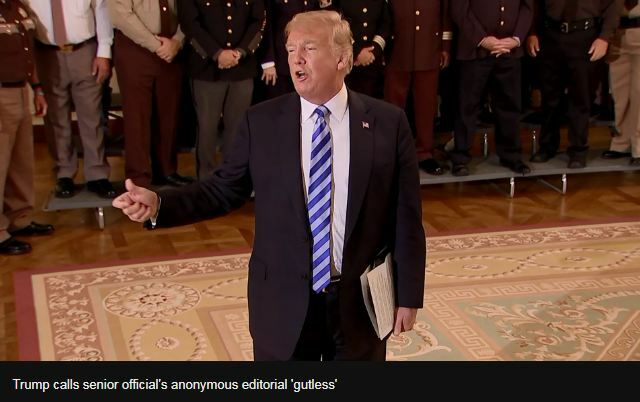 The president publicly described the article as "gutless" as his press secretary berated the author as a "coward" who, she suggested, should resign. The article followed published excerpts from a forthcoming book by Bob Woodward that included examples of Trump’s own cabinet officials and senior aides balking at his orders, defying his commands and privately disparaging him to others. The one-two punch comes as the FBI’s investigation, led by special counsel Robert Mueller, heats up. Over the summer, the president’s former campaign chairman was convicted, his former lawyer pleaded guilty, the chief financial officer of his private company was granted immunity and a dozen Russian intelligence officers were indicted — all stemming from an investigation into whether Trump’s presidential campaign conspired with Russia. Trump is also the subject of a separate criminal investigation into whether he obstructed justice. The president has refused to be interviewed by the special counsel, though people familiar with his legal strategy are hopeful he may be able to answer a limited number of written questions related to the Russia probe. On Wednesday, those close to the president said he was enraged by both the book and the anonymous opinion piece, and one senior administration official expressed anger at the "betrayal" by an unnamed colleague. Some close to the president speculated the story could add fuel to the president's ongoing battle with the media. Trump is “not just furious with the person (who wrote it) but furious The Times would run an unsigned op-ed,” said one person close to the White House. After staffers huddled behind closed doors in the minutes after the op-ed article was posted, strategizing a response, the president himself suggested on Twitter Wednesday that the author had committed treason. He then seemed to suggest that it was a fake. “This is a coup. It’s an administrative coup, a soft coup, a kooky coup, whatever you want to think,” Michael Caputo told CNN. White House officials, mounting a response reflecting intense anger at the article, said they did not know who wrote it. But finger-pointing was already underway, with questions about just how "senior" this official ultimately is. 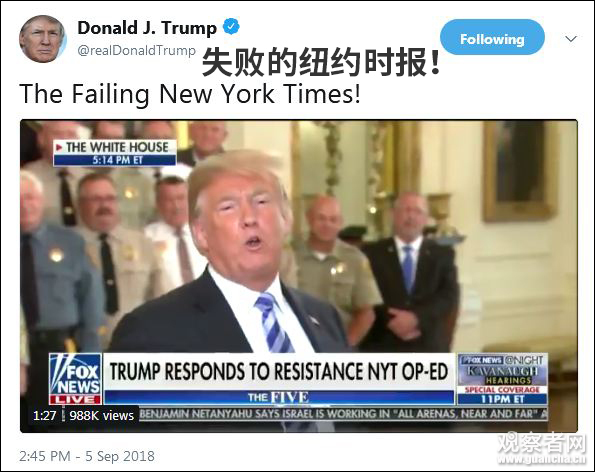 The New York Times did not respond to questions about how it characterized the op-ed's author. White House officials have spent much of the summer hunkered down amid an increasingly intensive FBI investigation and a string of foreign policy challenges from North Korea to trade negotiations to a collapsing Iran strategy. The August death of Sen. John McCain, eulogized as an American hero though he was personally loathed by Trump, also cast a shadow on the presidency in recent weeks, stirring up resentments fueled by the president’s initial refusal to bestow some of the markers of honor and national grief on a lifelong public servant and former prisoner of war. One person close to the president said a reference to McCain in Wednesday’s anonymous opinion article was a particular point of irritation for the president. A former administration official still close to the White House expressed concerns that the mounting scandals and divisions plaguing the president would hamper any remaining legislative agenda remaining in the first term. President Trump is facing a test to his presidency unlike any faced by a modern American leader. It’s not just that the special counsel looms large. 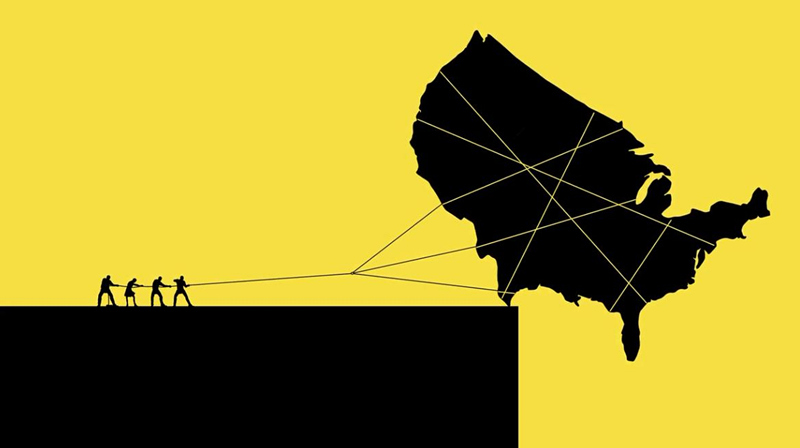 Or that the country is bitterly divided over Mr. Trump’s leadership. Or even that his party might well lose the House to an opposition hellbent on his downfall. 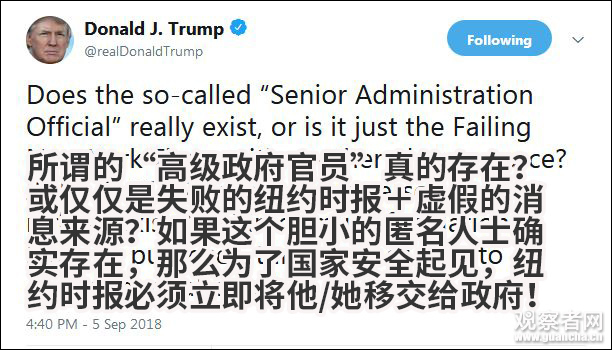 The dilemma — which he does not fully grasp — is that many of the senior officials in his own administration are working diligently from within to frustrate parts of his agenda and his worst inclinations. I would know. I am one of them. To be clear, ours is not the popular “resistance” of the left. We want the administration to succeed and think that many of its policies have already made America safer and more prosperous. But we believe our first duty is to this country, and the president continues to act in a manner that is detrimental to the health of our republic. That is why many Trump appointees have vowed to do what we can to preserve our democratic institutions while thwarting Mr. Trump’s more misguided impulses until he is out of office. The root of the problem is the president’s amorality. Anyone who works with him knows he is not moored to any discernible first principles that guide his decision making. to expel so many of Mr. Putin’s spies as punishment for the poisoning of a former Russian spy in Britain. He complained for weeks about senior staff members letting him get boxed into further confrontation with Russia, and he expressed frustration that the United States continued to impose sanctions on the country for its malign behavior. But his national security team knew better — such actions had to be taken, to hold Moscow accountable. This isn’t the work of the so-called deep state. It’s the work of the steady state. Given the instability many witnessed, there were early whispers within the cabinet of invoking the 25th Amendment, which would start a complex process for removing the president. But no one wanted to precipitate a constitutional crisis. So we will do what we can to steer the administration in the right direction until — one way or another — it’s over. The bigger concern is not what Mr. Trump has done to the presidency but rather what we as a nation have allowed him to do to us. We have sunk low with him and allowed our discourse to be stripped of civility. farewell letter. All Americans should heed his words and break free of the tribalism trap, with the high aim of uniting through our shared values and love of this great nation. We may no longer have Senator McCain. But we will always have his example — a lodestar for restoring honor to public life and our national dialogue. Mr. Trump may fear such honorable men, but we should revere them. There is a quiet resistance within the administration of people choosing to put country first. But the real difference will be made by everyday citizens rising above politics, reaching across the aisle and resolving to shed the labels in favor of a single one: Americans. The writer is a senior official in the Trump administration. A government photographer edited official pictures of Donald Trump’s inauguration to make the crowd appear bigger following a personal intervention from the president, according to newly released documents. The photographer cropped out empty space “where the crowd ended” for a new set of pictures requested by Trump on the first morning of his presidency, after he was angered by images showing his audience was smaller than Barack Obama’s in 2009. The detail was revealed in investigative reports released to the Guardian under the Freedom of Information Act by the inspector general of the US interior department. They shed new light on the first self-inflicted crisis of Trump’s presidency, when his White House falsely claimed he had attracted the biggest ever inauguration audience. The records detail a scramble within the National Park Service (NPS) on 21 January 2017 after an early-morning phone call between Trump and the acting NPS director, Michael Reynolds. They also state that Sean Spicer, then White House press secretary, called NPS officials repeatedly that day in pursuit of the more flattering photographs. It was not clear from the records which photographs were edited and whether they were released publicly. © Reuters A combination of photos shows the crowds attending the inauguration ceremonies of Donald Trump, left, and Barack Obama. The newly disclosed details were not included in the inspector general’s office’s final report on its inquiry into the saga, which was published in June last year and gave a different account of the NPS photographer’s actions. By the time Trump spoke on the telephone with Reynolds on the morning after the inauguration, then-and-now pictures of the national mall were circulating online showing that Trump’s crowd fell short of Obama’s. A reporter’s tweet containing one such pair of images was retweeted by the official NPS Twitter account. An NPS communications official, whose name was redacted in the released files, told investigators that Reynolds called her after speaking with the president and said Trump wanted pictures from the inauguration. She said “she got the impression that President Trump wanted to see pictures that appeared to depict more spectators in the crowd”, and that the images released so far showed “a lot of empty areas”. © Provided by Guardian News Sean Spicer delivers a statement on 21 January 2017 while a television screen shows a picture of Trump’s inauguration. The communications official said she “assumed” the photographs Trump was requesting “needed to be cropped”, but that Reynolds did not ask for this specifically. She then contacted the NPS photographer who had covered the event the day before. A second official, from the NPS public affairs department, told investigators that Spicer called her office on the morning of 21 January and asked for pictures that “accurately represented the inauguration crowd size”. In this official’s view, Spicer’s request amounted to “a request for NPS to provide photographs in which it appeared the inauguration crowd filled the majority of the space in the photograph”. She told investigators that she, too, contacted the NPS photographer to ask for additional shots. The NPS photographer, whose name was also redacted, told investigators he was contacted by an unidentified official who asked for “any photographs that showed the inauguration crowd sizes”. Having filed 25 photographs on inauguration day, he was asked to go back to his office and “edit a few more” for a second submission. The investigators said the photographer believed the cropping was what the official “had wanted him to do”, but that the official “had not specifically asked him to crop the photographs to show more of a crowd”. A summary in the inspector general’s final report said the photographer told investigators “he selected a number of photos, based on his professional judgment, that concentrated on the area of the national mall where most of the crowd was standing”. Asked to account for the discrepancy, Nancy DiPaolo, a spokeswoman for the inspector general, said the cropping was not mentioned in the final report because the photographer told investigators this was his “standard artistic practice”. But investigators did not note this in the write-up of their interview. The newly released files said Spicer was closely involved in the effort to obtain more favourable photographs. He called Reynolds immediately after the acting director spoke with Trump and then again at 3pm shortly before the new set of photographs was sent to the White House, investigators heard. Another official reported being called by Spicer. At about 5.40pm that day, Spicer began a now notorious press briefing at the White House in which he falsely stated: “This was the largest audience to ever witness an inauguration – period.” A spokeswoman for Spicer did not respond to a request for comment. The inspector general’s inquiry was prompted by a February 2017 complaint through the office’s website, alleging NPS officials tried to undermine Trump and leaked details of Trump’s call with Reynolds to the Washington Post, where it was first reported. The inspector general found no evidence to substantiate the allegations. The Guardian asked in its June 2017 freedom of information request for the identity of the complainant who sparked the inspector general’s inquiry. But this, and the entire complaint, was redacted in the released documents.